WHEELS: 17" X 7" ALUMINUM, TRANSMISSION: 6-SPEED AUTOMATIC (65RFE) -inc: 3.55 Rear Axle Ratio, TRAILER TOW MIRRORS & BRAKE GROUP -inc: Power Black Trailer Tow Mirrors, Exterior Mirrors Courtesy Lamps, Exterior Mirrors w/Supplemental Signals, Trailer Brake Control, Add Class IV Receiver Hitch, TRAILER BRAKE CONTROL, TIRES: P265/70R17 BSW AS (STD), SIRIUSXM SATELLITE RADIO (subscription required), REMOTE KEYLESS ENTRY W/ALL-SECURE, QUICK ORDER PACKAGE 25B TRADESMAN -inc: Engine: 5.7L V8 HEMI MDS VVT, Transmission: 6-Speed Automatic (65RFE), PROTECTION GROUP -inc: Transfer Case Skid Plate Shield, Front Suspension Skid Plate, Tow Hooks, POWER BLACK TRAILER TOW MIRRORS -inc: Exterior Mirrors Courtesy Lamps, Exterior Mirrors w/Supplemental Signals. 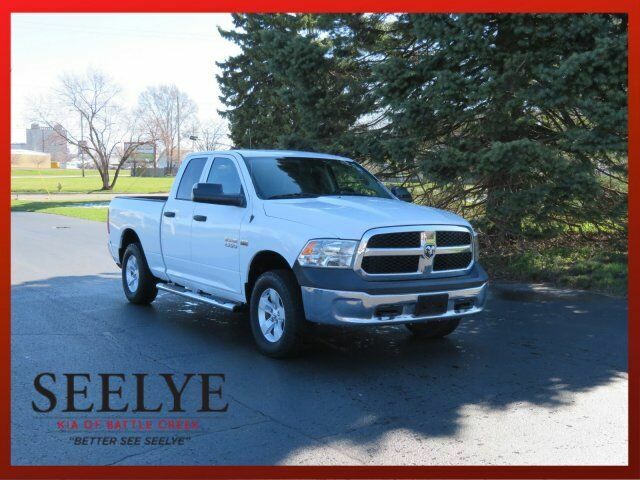 This Ram 1500 has a strong Regular Unleaded V-8 5.7 L/345 engine powering this Automatic transmission. GVWR: 6,800 LBS (STD), EXTERIOR APPEARANCE GROUP -inc: Bright Rear Bumper, Bright Grille, Wheels: 17" x 7" Aluminum, Bright Front Bumper, ENGINE: 5.7L V8 HEMI MDS VVT -inc: Dual Rear Exhaust w/Bright Tips, DIESEL GRAY/BLACK, CLOTH 40/20/40 BENCH SEAT, CARPET FLOOR COVERING, BRIGHT WHITE CLEARCOAT, ANTI-SPIN DIFFERENTIAL REAR AXLE, 32 GALLON FUEL TANK, 3.92 REAR AXLE RATIO, Variable Intermittent Wipers, Urethane Gear Shift Knob, Transmission: 8-Speed Automatic (845RE), Transmission w/Driver Selectable Mode and Oil Cooler, Tires: P265/70R17 BSW AS, Tire Specific Low Tire Pressure Warning, Tip Start, Tailgate Rear Cargo Access, Systems Monitor, Steel Spare Wheel, Spray-In Bed Liner.